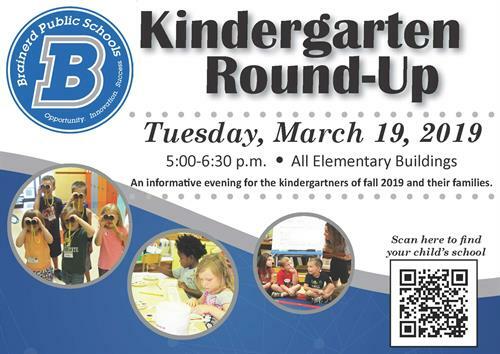 Brainerd Public Schools invites children who will start kindergarten this fall and their families to Kindergarten Round-Up at each of the six elementary schools on Tuesday, March 19, 5-6:30pm. The teachers and staff at Baxter, Garfield, Harrison, Lowell, Nisswa, and Riverside schools are excited to welcome the class of 2032 to elementary school. A short program will begin at each school at 5:00pm and be followed by school tours, meeting the teachers, exploring a school bus, a photo opportunity with each school’s mascot, and information about all kindergarten at Brainerd Public Schools has to offer. Future Warriors will leave Round-Up with a goody bag of items to help them prepare for school in the fall. Families unsure of which school their child will attend or those interested in open enrolling should call the Welcome Center at 218-454-6900 for more information. In partnership with the community, Brainerd Public Schools will ensure all students achieve their individual potential by providing the highest quality programs and resources to prepare learners for an ever-changing global society. For more information about Brainerd Public Schools, the kindergarten curriculum, and Kindergarten Round-Up, please see www.isd181.org.